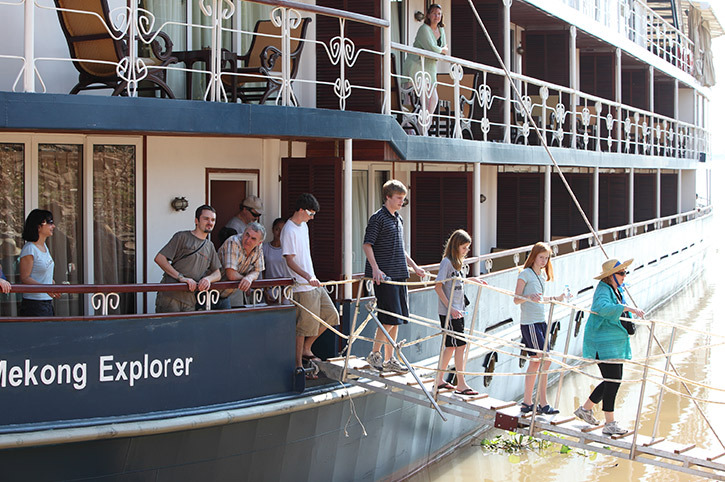 Discover the essence of South East Asia with a cruise along the mighty Mekong River. Begin in the Cambodian town of Siem Reap with its world heritage temples, before cruising past remote communities, lush farmland and floating villages to the bustling Vietnamese city of Saigon. 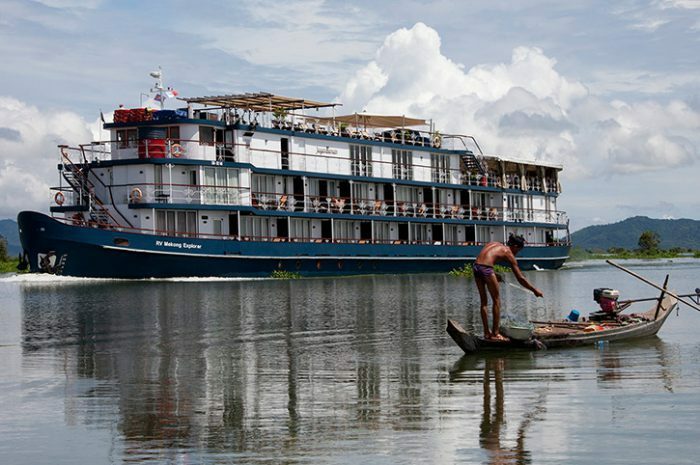 Transfer by coach to your luxury river boat for the beginning of your seven night cruise. 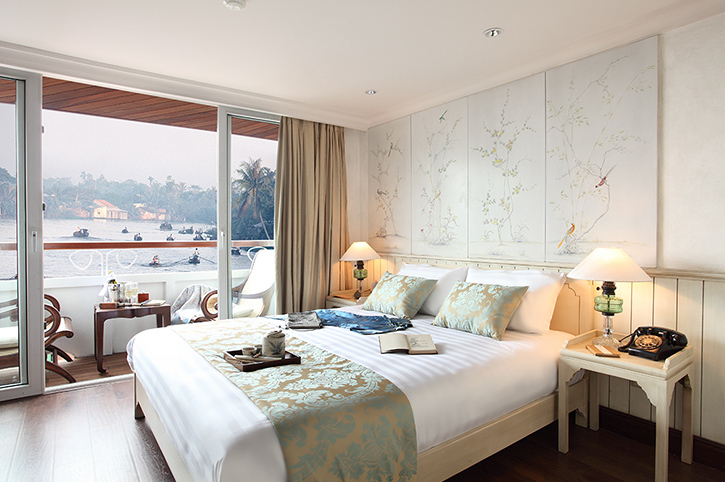 The Jayavarman has just 27 cabins and combines French-colonial elegance with Asian charm. Guests can enjoy a range of facilities including a plunge pool on the sundeck and a panoramic lounge. Travel by road to Wat Hanchey which built in the 8th century, predates the Angkor temples. There is the opportunity to climb the steps for magnificent views, before returning to the ship for a monks blessing ceremony. 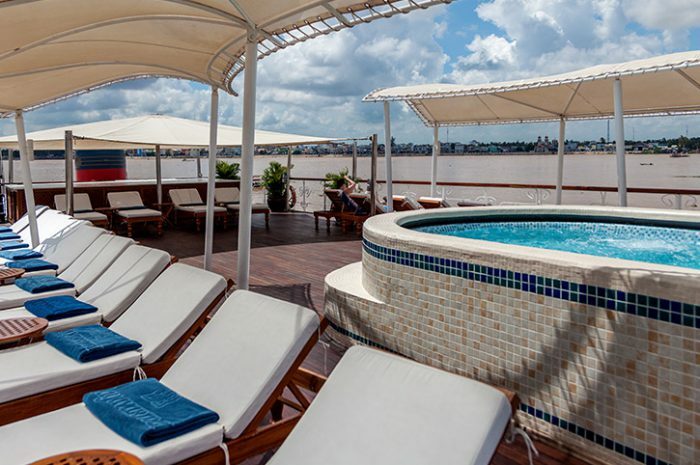 Enjoy views of traditional river life as you cruise down the Mekong River. This evening, enjoy a welcome dinner in the ship’s IndoChina Restaurant. This morning you may like to try some Tai Chi on the sun deck as the ship sails towards the village of Angkor Ban where the locals live in traditional houses and pursue a lifestyle largely untouched by the modern world. After lunch back on board, sail to Oknha Tey which is an island in the middle of the Mekong River and renowned for its high class silk products. Explore the island by tuk tuk visiting a workshops to learn everything about silk; from how it is produced by worms, to the final luxury product. Embark at the bustling rural port of Kampong Chhnang for a small boat adventure of the wetlands including a visit a floating village. Back on the Jayavarman, cruise along the meandering Tonle River with a stop at Kampong Tralach to experience local transportation in an ox-cart. Continue to Phnom Penh, Cambodia’s capital where the ship moors for the night. A day exploring Phnom Penh with a visit to the opulent Royal Palace and the impressive Silver Pagoda. After lunch, join an excursion to the infamous Killing Fields and the Tuol Sleng Genocide Museum where millions suffered at the hands of the Khmer Rouge. After dinner there is free time to explore the city by night. Enjoy a relaxing day on board as you head towards the Vietnamese border. Perhaps take in a fruit-carving demonstration by the ship’s chefs, or simply enjoy the ever changing river scenery. Arrive in the Vietnamese town of Chau Doc where the ship moors overnight. 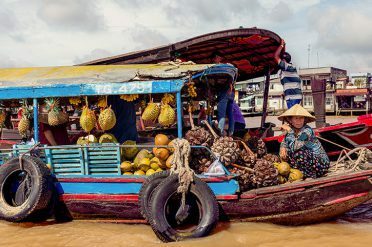 For early risers, there is an optional early morning visit to the bustling floating market of Chau Doc. After breakfast, venture ashore for a wonderful cycle tour of Chau Doc to visit the colourful market and ancient temple. In a small boat explore the tributaries and floating villages before returning to the ship for lunch. Later visit My An Hung Village and walk through a family’s farm to their house for tea. 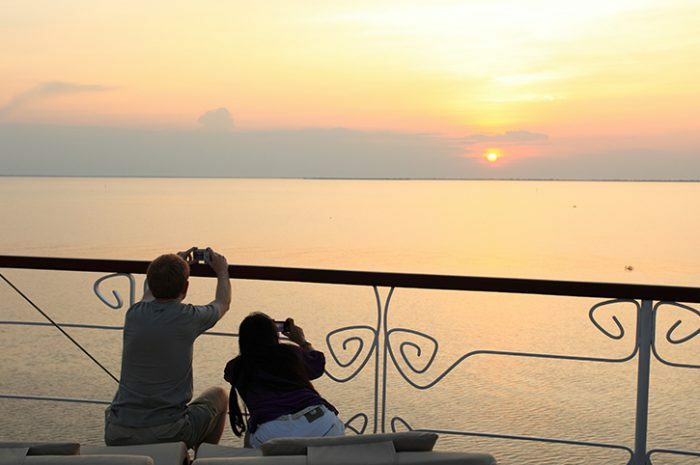 Back on board there is time to relax and socialise with your fellow passengers as you sail for Sa Dec. This morning take a boat ride to Binh Thanh Island where you can interact with the local villagers who produce a variety of rattan goods. After lunch, visit the town of Cai Be, known for its floating market where you will see boats laden with fresh fruit and vegetables. Tonight enjoy a farewell dinner as you head towards your final destination. Today disembark The Jayavarman at the Mekong river-port city of My Tho and travel by coach to Saigon. Speak to your consultant about adding a few nights in this thriving city to discover its many attractions. We can also book The Jahan, sister ship to the Jayavarman. Please inquire for dates and prices. Book by 15Sep on valid departures. Departs every Saturday except May-Jun. Price excludes gratuities and is based on travel from Jul-Sep. Itinerary on days 1-2 may vary due to water levels. All prices are per person, based on 2 sharing a cabin, and include meals where shown. Seasonal variations may apply, please call Freedom Destinations for more information and availability. 15% Discount – Must be booked by 15Sep 2019 on selected departures and is subject to availability. Available for both the Jayavarman boat and the sister boat, the Jahan. Explore Asia’s mighty waterways with their beautiful scenery and insight into local life. Enjoy private cabins, superb dining and plenty of on and off shore experiences.